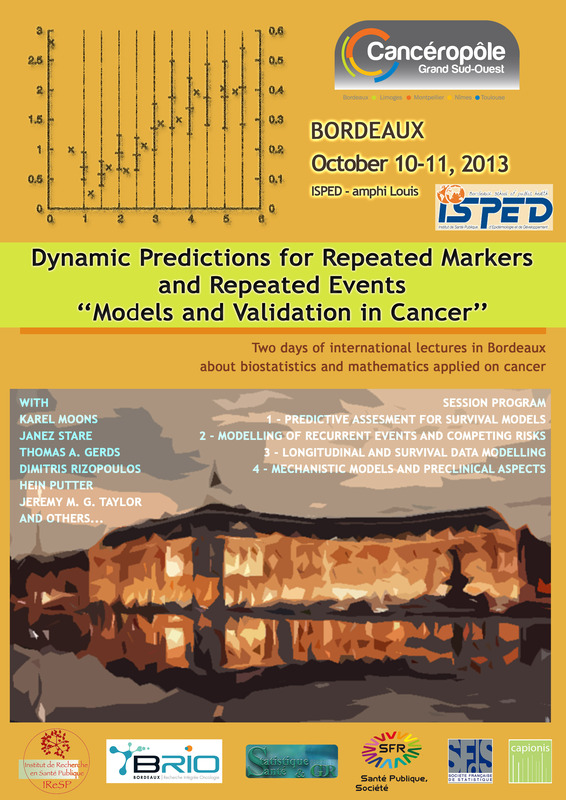 Over two days, this workshop will provide an opportunity for epidemiologists, biostatisticians and mathematicians, actors and researchers in the field of health to learn about innovative methods of data modeling, and the cancer prediction tools available to prevent the events of patients with cancer. Prediction models are used more and more to complement clinical reasoning, especially in the field of cancer. For this reason, the statistical models developed must provide accurate estimates and validated predicted probabilities on individuals targeted. However, even if the statistical and mathematical models have been widely developed and are still growing, methods of validating these approaches still require extensive research. Experts in the field have been solicited and have responded favorably. An important place is also left to the posters. The objective of this workshop, without registration fee for participants will be also to intensify the exchange between all actors in the data analysis of cancer: biostatisticians, mathematicians, but also epidemiologists and clinicians. This is the hope of the organizers of this workshop, who are associated for the first time on this topic. Appointment from 10 to 11 October 2013 to discuss and debate!" These two days of workshop will result in extensive lectures, but also leave room for posters wide open to juniors researchers. Call for posters communications - Dead line postponed to: 8 of September . Registration - Dead line : October 1st.